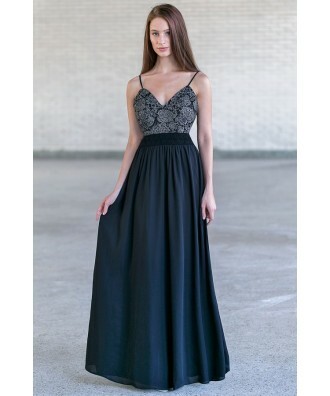 You have added Fancy Fascination Black Lace and Chiffon Maxi Dress into shopping cart. You’ll be fascinated with all the gorgeous detailing of this maxi dress! The Fancy Fascination Black Lace and Chiffon Maxi Dress is fully lined. It has a slight V shaped neckline, adjustable straps, an open back and a full length maxi skirt. The top is black crochet lace with shiny silver threading and miniature sequins throughout. This gives it the perfect touch of glimmer! The waistband is crochet lace and the back of the dress is open with a tie closure. An exposed zipper completes the dress. This pretty dress is perfect for any Holiday party or formal dance. Pair this with metallic jewelry and heels. Details: Fully lined. Adjustable straps. Exposed back zipper. 100% polyester. Dry clean only. Small measurements: Length from top of bust to hemline: 53”. Bust: 32”. You have added Fancy Fascination Black Lace and Chiffon Maxi Dress into Wishlist. You have added Fancy Fascination Black Lace and Chiffon Maxi Dress for Stock Notification. You have set Fancy Fascination Black Lace and Chiffon Maxi Dress as a loved product. You have removed Fancy Fascination Black Lace and Chiffon Maxi Dress as a loved product.